The most important offering to Lord Shiva is bilva or bel leaves (Belpatra) and clean water. Other offerings include white color flowers especially Datura flower. 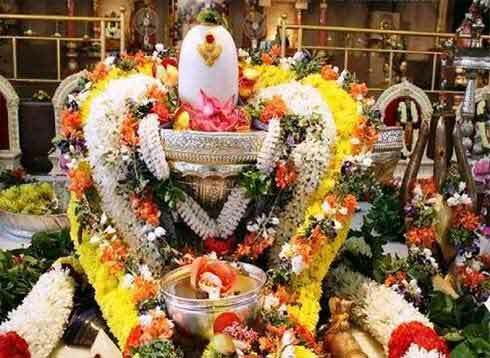 The offerings should be made on Monday or Pradosh or Shivratri or Shiva Chaturdashi. Offering uncooked rice to Shiva helps in material gains – money and wealth. Til or Sesame helps in sin redemption. Wheat helps in healthy children. Jowar helps in attaining happiness and comfort. Offering water helps in alleviating various diseases. Offering milk helps in improvement of mental health and intelligence. Sugarcane juice for enjoying various pleasures in life. Water from Ganga River to attain moksha. Honey is offered for early cure of diseases. Ghee to overcome bad health and to have good immunity. Jasmine flower helps in getting vehicles and beautiful or handsome partner. It is believed that those who offer jasmine lower will never have to go hungry. Leaves of shami tree to attain moksha. Oleander, or Kaner flower, offering helps in attaining good clothes. Offering night jasmine helps in attaining peace and prosperity. Durva grass offering helps in long life. Why Ketaki Flower is not offered to Lord Shiva? Why Champaka Flowers Are Not Used In the Worship of Lord Shiva?